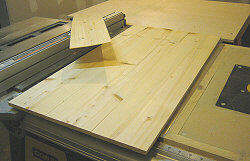 Resawing is simply cutting a thicker board into two or more thinner boards. The board is cut on it's edge, so that the full width of the original board is retained. 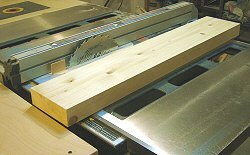 This kind of operation can be done on either the band saw or table saw. In my opinion, the table saw leaves a much nicer finish with less clean up required, even on lumber up to 7" wide. 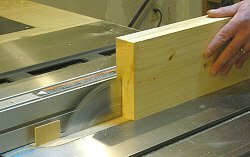 Ripping lumber (especially wide lumber) on edge with the table saw does require a bit of common sense though, to be done safely. This yellow cedar board will be ripped into three thinner boards. Trying to resaw a warped, cupped or badly twisted board is the first no-no to avoid. Not only is it flat out dangerous, it's hard on the saw. Always mill lumber flat and square on at least three sides (both edges and one face) before attempting any resawing. Use a ripping blade. A ripping blade is designed for this kind of work and has deep gullets to evacuate all the waste created by resawing. The blade I'm using in this article is the Freud LM72M010 , a 24 tooth, full kerf flat top grind that works great even for underpowered saws like mine. I paid less than fifty bucks for this blade and it's ripped a lot of wood for me. Good deal and great value. 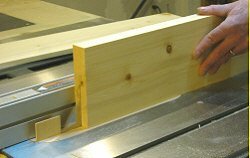 To help avoid kickback, always use a table saw splitter, either the stock unit (if the pawls are high enough) or one mounted in a zero clearance insert. The splitter will keep the kerf from closing and binding on the blade. It will also keep the piece you're ripping against the fence and guide it safely past the blade. Use some kind of outfeed support. It doesn't have to be fancy, I use a couple of saw horses with a piece of 1/2" plywood screwed to the top. The top of the outfeed should sit a little under the top of the saw's table. The outfeed lets you push the stock through the back of the blade without having to try and hold it up, putting your hands in a dangerous position too close to the blade. 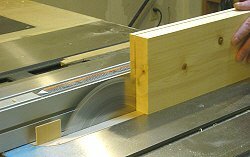 Resawing is like any other cutting operation performed on the table saw, it can be done safely and accurately if you pay attention to details and use the right equipment. If there's anything I've learned over the years when it comes to ripping wood, it's cut more than you need for the job and cut it oversize. This is especially true when you resaw freshly milled stock. Due to stresses that are released when the wood is worked, some of the boards may twist or bow a tad after they're resawn. I try and let the wood settle for a day or so after it's cut before I finish milling it to it's final dimensions. This is the first cut. The ripping blade height is set at just over half the width of the stock. The yellow cedar I'm using in this demonstration is pretty stable, but I'll leave an extra 1/8" on each board for jointing and planing to get a perfectly flat board. Since my finished size will be 3/8", I'll rip each piece 1/2" thick, which is what I adjust the fence to. Because yellow cedar is a softwood and rips fairly easy, I can get away with two cuts per piece on this 5 1/4" wide board. I set the blade height at 2 3/4", just past the half way point. If this was a piece of hardwood like cherry or maple, I'd have to make at least four cuts, taking a 1 3/8" cut from each edge and then raise the blade and repeat until I was through. There are many variables with different saws and blades, so the only way to tell for sure is to see what you can get away with. The workpiece is flipped edge for edge, keeping the same face against the fence, for the second cut. Whenever you're ripping wood this deep, listen to the saw. If it starts to slow down, you're feeding to fast. If you smell wood burning, you're not feeding the stock fast enough. A steady rate, just before the point where the saw starts to slow seems to work best for me. After the first pass is made, flip the board edge for edge, keeping the same side against the fence. When you get near the end of the second cut (or the last cut if you're making more than two), use a push stick on the piece against the fence and push it past the blade and splitter onto your outfeed table. Don't be tempted to push it through with your hand just because it's higher than the blade. The workpiece in position for the first cut on the second board. Check to make sure you still have a flat surface on the face of the workpiece before ripping the second board. If you did everything right, it should be fairly smooth. If it isn't, touch it up with a hand plane or make a quick, shallow cut on the jointer to clean it up. When you get to the last cut and there's only a thin veneer left to remove on the last board, you can either take it off with the saw as I did, or plane it off later when you do the finish milling. I usually keep them, they come in handy for patchwork, laminating the edges of plywood, inlaying and many other uses. There's not much I throw away, but finding it after I stashed it away some place is another story. I now have three 1/2" thick boards for my project. The leftover piece on the fence is about .050" thick. These three boards turned out pretty nice and will probably only need to be planed down to size. I've ripped lots of yellow cedar and it usually stays pretty flat after resawing. I'll let them sit for a day just to be sure though. The advantages of ripping lumber to thickness are many. If you need an oddball size for some project, you simply cut it out of stock you probably already have on hand. Even if you're resawing to standard sizes like 3/4", you'll save a bit of money by processing your own wood. The widest board I've ever resawn was a birch 2 x 8, which I cut down the center. Since the maximum cutting height on my contractor saw is about 3 3/8", I had to cut through the inch or so of material left in the center with a hand saw to separate the two pieces. A trip through the planer cleaned the bump off.